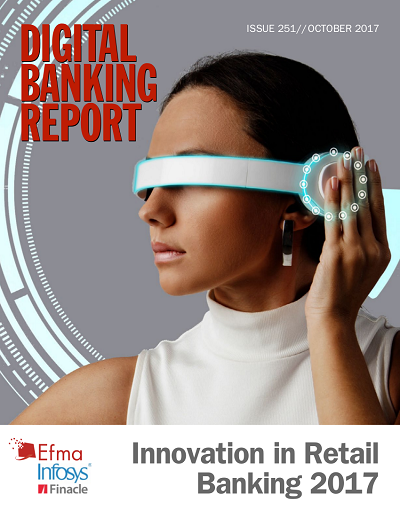 The Digital Banking Report is honored to have the opportunity to partner with Efma and Infosys Finacle in the development and publication of their 9th Innovation in Retail Banking report. With the results of a global survey of more than 250 financial institutions, case studies from organizations of all sizes and insight contributions from some of the most respected innovators in banking, this is a must-read for all executives involved in the innovation process. As has been found in previous years’ reports, the innovation agenda has become intertwined with the digitalization agenda, where transforming back-office core processes and customer facing experiences are brought together by application of data and advanced analytics. The level of investment in both digitalization and innovation has increased in lockstep with each other as a result. The report illustrates the varying priorities of organizations of different sizes and the challenges and opportunities in the marketplace. More than ever, it is clear that having a defined innovation business model, with the application of data and advanced insights, is an imperative for success. It is also clear that being a ‘fast follower’ is not a viable strategy. We would like to thank Efma and Infosys Finacle for their partnership and their sponsoring of the 9th annual Innovation in Retail Banking research report. Their partnership has enabled us to create the most robust benchmarking of digitalization and innovation in banking, and to better understand the impact across all components of the financial services ecosystem. As more organizations of all sizes are trying to keep pace with the capabilities and experiences provided by the large tech firms like Google, Amazon, Facebook and Apple (GAFA), this research provides a roadmap for planning, strategy development, deployment and for setting key performance indicators (KPIs). An analysis of the global state of innovation in the banking industry, covering commitment to innovation, the innovation process, focus of innovation strategies, challenges, future trends and opportunities in the marketplace.